How can we help save her? Charles I guess it basically comes down to what people can offer in the way of their abilities to offer. For example the mere fact you could post your comment, has come about through someone putting in the time to create this website. There are many avenues and differing levels of involvement needed in those different avenues, to get things going and to sustain them. I guess if people can put forward what they can offer to a project to save her, it can be ascertained what can be done and how quickly. To save her she obviously needs raising, and pretty quickly, its approaching two months since she settled now, so time is the number one enemy! Any areas of expertise or ability to “lend a hand” I suppose is a good start for it all to be collated! Martin, enthusiasm is a good thing, and I think the old Navy phrase is “one volunteer is worth ten pressed men” but has she not been in the water too long? Some of the images show vegetation growing out of the wood, and the decking looks horrible? Either way, I have signed up to be kept appraised, and I am willing to help as I live quite close. Your are right, we could do more to save our maritime heritage. But I suppose the problem is where to ‘park’ them if we could save more. There is undoubtedly plenty of space in many of our seafaring towns/cities but all they seem to want to do is turn them into living/shopping/marina ‘experiences’ (a la Peel with Liverpool and Wirral Waters). Surely they could integrate the old with the new and show what Liverpool/Birkenhead was all about when we had huge fleets of ships (both war and merchant). I did try to post a few days back but my internet played up or something. The “Trees” people are referring to are those Budlea things that grow all-over railways etc, and whilst not doing any good, are on areas that need replacing anyway, her decks have long been an area of concern, but at the end of the day are just planks of well shaped wood, I own a wooden motorboat and they are not all that hard to remedy, the only issue being which wood you can afford to use! 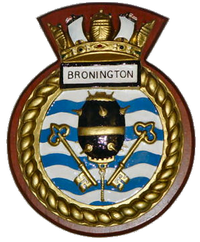 With the water issue, she has been in approaching two months now, there was a serving Ton boat that san in more salty water (Bronny is further up her respective estuary) and once raised after a rather quick “refirb” served another two years as a commissioned ship before being one of a few to succumb to cut backs. With the voluntary rather than pressed men showing interest Im sure were approaching 100 pressed men if not more I know I’m up for donning my Ovvies to get stuck in! I’m also following this with great interest and hoping for a positive outcome! This maritime nation should look after our heritage. She should be lifted and moved to one of our historic dickyards to dry out and be restored. 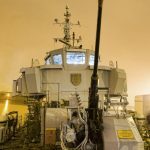 These little ships served our nation well and should be preserved for future generations. It,s about time the lottery fund was used for something like this. I seem to remember that the “Dunkirk little ships”eventually got some funding. Pictures of her sitting sunk in the dock and pictures showing her with plants growing looking as if she is on dry land. Where is she actually right now? Who owns her? Could she be purchased (should be pretty cheap in her current condition). I have seen and been part of restorations of things in far worse condition…. at least you can still recognise her! If someone can answer the above maybe we can actually put together a plan. 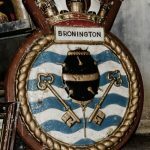 Do you think HMS Bronington should be saved? error: Contact us if you want a copy.